Georgia have named a squad filled with Heineken Cup experience ahead of the 2011 Rugby World Cup. The toughness of the Georgian forwards came as a surprise to some observers at their World Cup debut in 2003. It ought not have done; many of the national side ply their trade in French rugby, an arena not known for timidity. Of the 30-man squad announced for the 2011 edition, several play for Top 14 sides such as Castres, Brive, Toulon, Montpellier and Clermont Auvergne. Georgia are in Pool B with England, as they were in 2003 when then-England captain Martin Johnson paid credit to their tenacity. "They were tough and physical and we didn't have it all our own way," Johnson said. In 2007, Georgia comprehensively beat Namibia and came within four points of a huge upset against Ireland, after which Irish captain Brian O'Driscoll said: "They really came out and obviously put a huge amount of pressure on us, particularly up front. And once they were within a sniff, they grew in confidence." 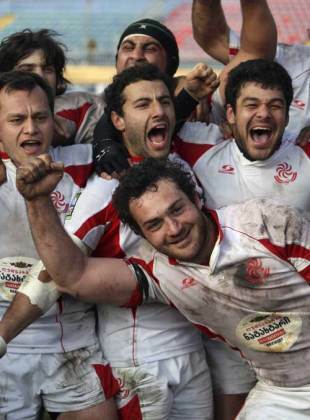 Mamuka Gorgodze, part of the Georgian effort that day, is back for 2011. The forward has garnered plenty of praise at his club side Montpellier. Two players from coach Richie Dixon's training squad were ruled out by injury - Giorgi Begadze with a hand injury and Zviad Maisuradze with a knee complaint - but Georgia will look to continue their impressive form in the European Nations Cup, losing just once in securing their place at RWC 2011.